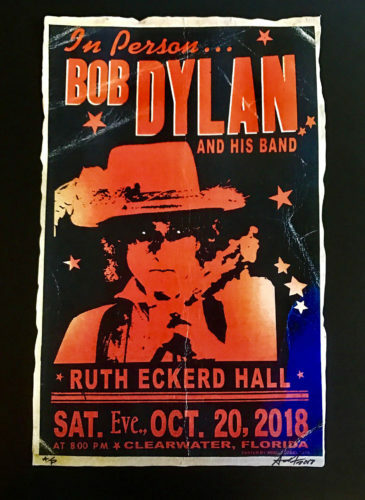 BOB DYLAN – FLORIDA CONCERT POSTER – Ruth Eckerd Hall, Clearwater 2018. Extremely limited signed and marked “A/P” (artist’s proof) of this beautiful poster by Adam Turkel. Each poster is individually hand cut and has a great old tyme weathered feel! The photo doesn’t do it justice! Limited quantity available.